I just wanted to say how wonderful the CNA program has been for me. Marie, our instructor is a wonderful teacher who is very thorough. She has so much knowledge about the medical field. Art and Michelle who are at the front desk are extremely helpful in every way. It was such a pleasure to be part of this program. During the program, I made a lot of friends and learned so much. When I arrived at my test site I felt very confident. I got a perfect score on my written and skills exam. All of the tests that Marie gave us really prepared me for what was to come. I am a college graduate and have a masters degree in another field. I wanted to do something else, and after these four weeks I am ready and confident to go into a nursing home or hospital and give the best care possible. Thank you to everyone at New Millennium Training center! My daughter completed the Full Medical Assistant class and I cannot tell you how happy she was with the school, the instructor and all of the help they gave her every step of he way. Vanessa knows more about medical care and what to do than anybody in the family (we call her DOC). Keep up the good work! Just a little comment to let everyone know just how wonderful your school has been for my son. As a CNA from your school, he was hired full time on the spot. They asked him if he could take vital signs, he showed them and then he saw the Director of Nursing and was hired on the spot. Just a young man earning about $40,000/yr and overtimes makes even more. My other son is a college graduate and earns the same amount of money. I wish I knew about The New millennium Training Center a few years ago. Thank You and continued success. 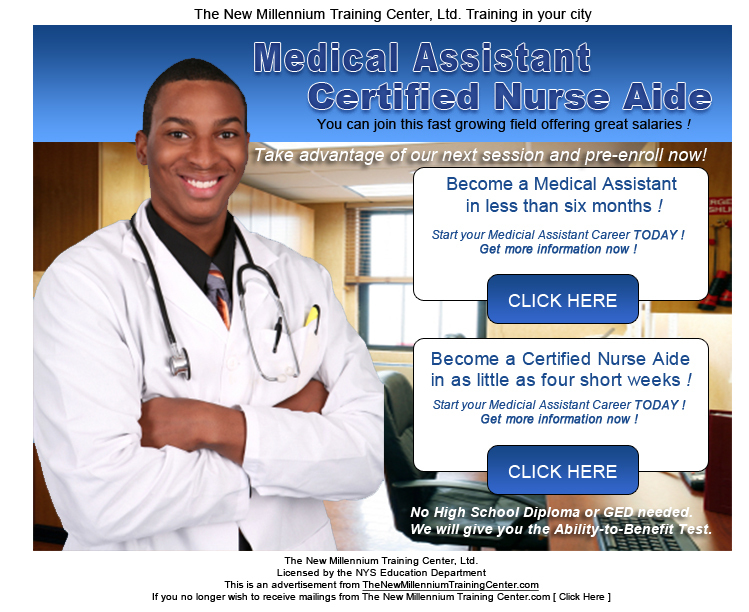 I am so glad I came to The New Millennium Training Center for my Full Medical Assistant Program. I passed all of the exams, and graduated. I really know how to work in the medical field. I mean the training was excellent. I do ekgs, draw blood, give injections, assist with medical procedures..etc.. I can do so much more than I ever thought possible. I finished my externship at a top physician's practice that the school is affiliated with and then they got a call from a surgical group who interviewed me and I was hired on the spot. Its all falling into place. Not bad for a lady that doesn't have a degree !! Currently I am in my final days of taking my CNA classes here at The New Millennium Training Center. Nothing has been as great in my life before I signed up to this wonderful center. First I would like to say, Marie is a wonderful instructor, Mr. Art and Michelle have been fantastic, very respectful and easy-going which makes class times very comfortable when attending. All in all, I've made the best choice, and I know exactly who to thank when my ultimate goal is complete. Thank you so much Millennium Training Center! I received a voucher for the Medical Assistant program and that made it possible for me to become a Full Medical Assistant and I will always have that skill to find employment no matter where I live. I'm writing to tell everyone just how simple the school made it for me to become a nursing assistant in a short time. This wasn't school it was training. Millennium gives you the booklet with all of the questions and answers for the state board exam from the department of health. All I had to do was read them and practice them and when I took my state board exam, I think I already knew every answer and passed the 1st time. It just dosen't get any easier than that. Anyway, the job seach was easy because places recognize the school and I started right away at over $ 16/hr and they said that in 3 months I'll go up to $17.50/hr. In a year I'll be making over $45K with some overtimes.I very thankful that I went to The New millennium Training and Mr. and Michelle and the other staff were just great. Thank you all !!! Thank you so much for the greatest learning experience. 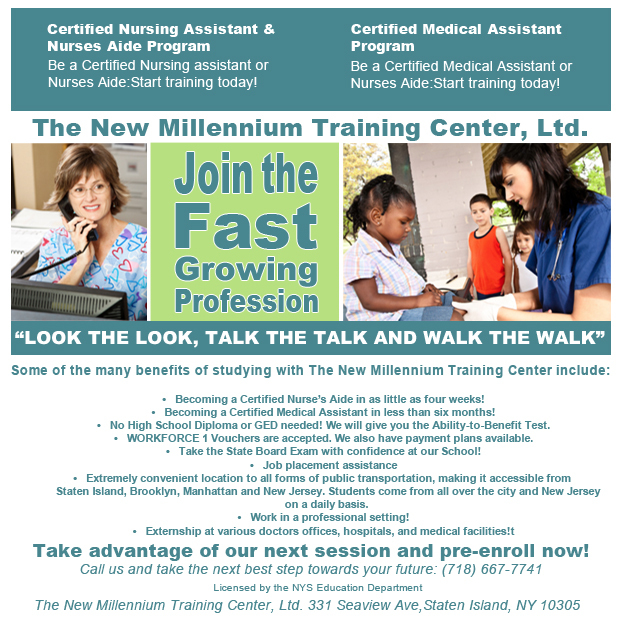 The New Millenium School for medical assistant is the quinticential school for a new career or recareering. Thank you Art and Michelle and a special thanks to the most wonderful teacher Kelly for making everyday at school a fun great experience. 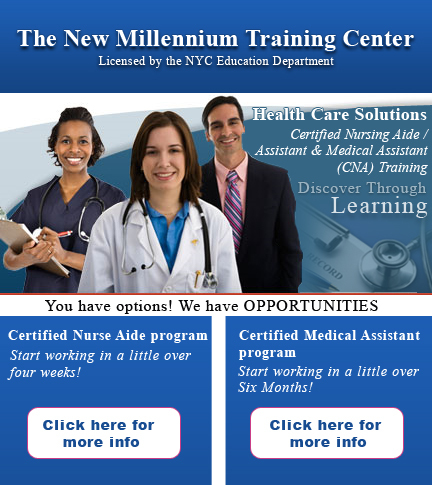 I fully recommend The New Millennium Training Center for Nursing Programs and Certified Medical Assistance. The school is totally vested in helping you succeed! The New Millennium Training Center is a professional training facility and instructor know what she is teaching. I am now CNA and was employed immediately full time at hospital. So I am working now because I went to good school that hospital HR knew about. Natalia B. The New Millennium Training Center Medical Assistant Training Program was 3X's cheaper than going to most of the other trade schools and about less tghan 2X's shorter than those inflated large school programs. This school taught me what I had to know to get a professional job in a doctor's office. The school is so well known hat while I was there, two people came into the school. One was a doctor and the other was an office manager. Both of them came into the school to ask if there were any medical assistants looking for work right away. I already have my internship lined up with a top internal medical practice that works both in Staten Island and Brooklyn. I'm glad I made the right choice. At $5500 for the same course that most other schools charge 15K for, I made the right choice. I graduated from the CNA school and immediately took my State Board Examination right in my school (TNMTC). The state examiner was verty nice and said "she never has any problems with Millennium students." I passed and immediately applied at the Staten Island Hospital right next door. I did just what Mr. Art said would work. I was in pressed scrubs with my name tag on and my stethescope around my neck. I had my picture on my resume and cover letter and had rehersed what I was going to say. They hired me on the spot. I repeated the same procedure and also was hired at a nursing home on the weekends. 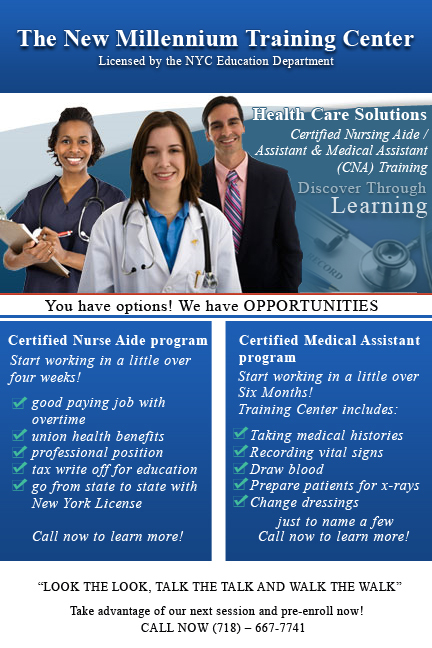 If I knew about Millennium I would have enrolled and become a CNA a long time ago. This school has been active in Staten Island for over 20 years and all facilities hire their graduates. Thank you again and again ! After graduating from the CNA school and my sister from the Medical Assistant school, we both started working immediately. We didn't know how great going to a vocational trade school could be. Its as professional as college, only at a fraction of the cost and time.. They're serious at The New Millennium while at the same time make it fun and you want to attend everyday. This the way learning should be. Thanks to Millennium, I was professionally trained to earn a living and both my sisiter and I have been doing just that ! My Medical Assistant class was fast and easy too. Especially when we all got together for study groups in the class before each test. That made it easy for us all to pass every exam and really know our stuff. I wish that my previous instructors (and classes) were taught this way. I only have could things to say about The New Millennium Training Center. I recommend anyone looking for a 1st or 2nd career to come to this quick and inexpensive school. You won't be sorry. I am a Professional Medical Assistant and am scheduled to take the National Competency Exam with the National Healthcare Association. Thanks to The New Millennium, my training was complete and my internship site didn't want me to leave and offered me a position right after graduation with a pay increase after three months and another one in six months. Its just like the school said and it really does pay to go to the right school and my entire programs was at least 3 Xs less expensive than anywhere else...Thnks New Millennium and Staff for all you've done for me and my family. I will recommend your school to anyone I run into. I was very satisfied with the training that I received at The New Millennium Training Center. My quick 4 week class not only got me a NYS license as a CNA, but I also landed a job right out of school making $17.50/hr to start and in 3 months I get an increase and a chance to do lots of time and half and weekends too. Only 4 weeks opened up new dooros to my financial solutions. Its a pretty good feeling knowing I have extra money in my pocket after paying off all of my bills each month. This was money well spent !! The New Millennium Training Center gave me the opportunity to quickly get a good paying job at a nursing home with union benefits. I think the instructror made it easy for us and Mr. Art is a great lecturer who really prepared all of us for proper resume writing and interview technique that paid off when I went for interviews. I am currently making more money than I ever did before and I work nearly full time at two differnt facilities. I'm used to the hours noow and the double pay checks gave me a new life. Thank you very much for helping me make a successful career change that took only 4 short weeks. I'm earning over $18/hr part time but soon I'll go to full time and that means weekly extra shifts at time and 1/2. The New Millennium taught me how to hit the ground running and the people at the nursing home know the school and the caliber of their training, so that was a plus when I had my interview and got hired.